In the second part of the series we will follow the process of how to create "Columns" in a content type. "Columns" will become of of they key parts of the Document Management System as it will be the fastest way of searching documents. 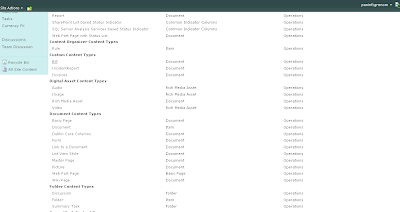 Think in "Columns" as fields, every document will be the document itself (.doc) plus a bunch of fields. These fields can be customize by adding the out-of-the-box ones you need or by creating your own ones. In this part we will concentrate in adding the out-of-the-box ones, leaving the custom ones for the next chapter. 1- Go to Site Actions -> Site Settings -> Site Content Types. 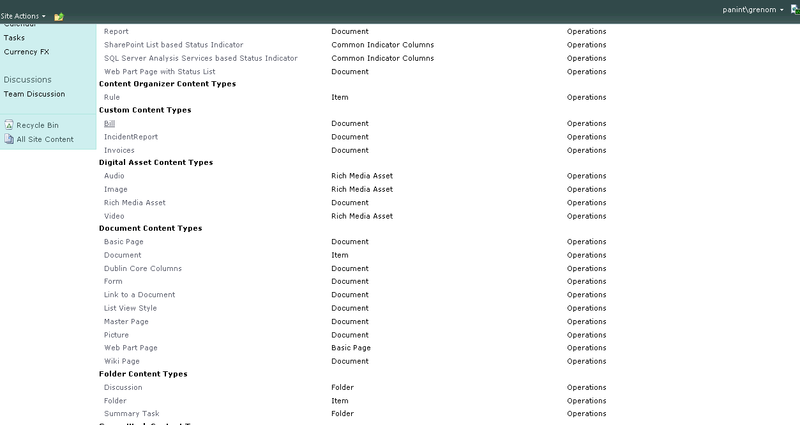 2- Look for "Custom Content Types". 4- You should reach this screen "Site Content Type Information". 5- Click "Add from existing site columns"
6- Select "Select columns from:" -> Status indicators, and in "Available columns", select Description and click in Add. Now select "Core contact and Calendar Columns" and select Address and Company. Click on "Ok". 7- If you add a new "Bill" you should be able to see the columns. Don't forget to update the view to see the columns (if you to see them). 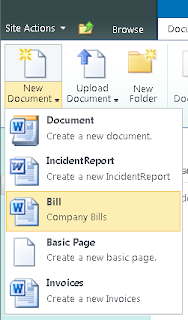 Columns in a Sharepoint DMS is one of the most powerful tools to manage the documents. 'New Document' requires a Microsoft SharePoint Foundation-compatible application and web browser. 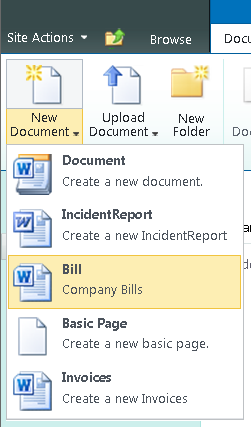 To add a document to this document library, click the 'Upload Document' button. 2- On the File tab, click New. 3- Under Store Notebook On, click Network. 4- Type a name for the notebook in the Name field. 5- Under Network Location, select the SharePoint location where you want to add the OneNote notebook. stssync:// protocol, such as Microsoft Outlook. library, the user must upload one picture at a time by using Upload.aspx. document, edit it, and then save it back to the server. menu to check out the document, edit it, and then check it in by using the Edit menu. browsers pop-up blockers for SharePoint sites.